Fossil Nate JR1354 to niezawodny i niezwykle porywający zegarek męski. Tworzywo, z którego wykonana jest koperta to stal galwanicznie pokryta czarną powłoką, co świadczy o wysokiej jakości produktu, natomiast tarcza nadaje zegarkowi charakteru przez swój wyjątkowy czarny kolor. Zegarek wyposażony jest, między innymi, w chronograf (stoper) i funkcję daty. Jeżeli chodzi o wodoszczelność, zegarek jest odporny do 50 metrów. Oznacza to iż może być zanurzony w wodzie - nadaje się do pływania ale nie gwarantuje odporności przy wskakiwaniu do basenu. Zegarek jest wysyłany z 2-letnią grawancją i oryginalnym opakowaniem od producenta. Everthing excellent : thank you. First Fossil watch I own. Got it a couple of days ago for myself. Was afraid of the grey and black contrast at first but its perfectly readable in normal lighting conditions. My first ever watch that has no or no noticeable plastic parts. I love it so far! - Very loud watch. Cant have it on my nightstand, keeps me awake. So happy with my purchase. Ordered it as a present for Christmas for my fiancè, delivery was quick and hassle free. Great watch, looks great and always gets complimented. Only downside is the size of the watch face as it can hurt the wrist bone. Perfect Christmas gift! The watch is very big and with this its heavy, but its absolutely perfect! We bought this for our sons 16th birthday and he absolutely loves it. 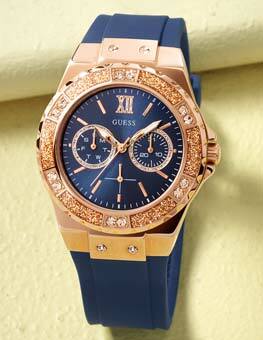 A lovely, quality watch that looks stunning on. Great price and great ordering system and delivery. Very nice watch, looks more expensive than what it actually is and seems really well made. Really stylish and goes with everthing. Packaged in a cool tin box as well. Watch was lovely was a present for my dads 50th and he loved it, the pictures really dont do it justice at all! The watch is the same like the picture about it on the website. Excellent watch. I bought this watch as a gift for my little brother. He totally loved it. Wasnt expecting it to be quite as big but all the better! Got this for my husband for his birthday. He loves it! Perfect modern watch - present for husband. He loves fossil as a brand but this is different from the usual. Very impressed with the quality of this watch. I have bought it for my sons Christmas present and I am sure he will be really pleased with it. Service was extremely good also. I recently purchased this as a Christmas gift for my boyfriend. It is absolutely beautiful, Im delighted with it and know he will love it! 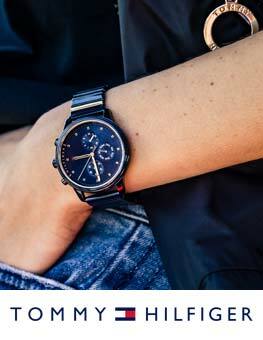 The matte black with the leather strap gives it a luxurious, expensive feel. The Watch Shop is so efficient. My parcel arrived so quickly! Perfect gift for a men. The delivery was fast enough with no problems. Great looking watch. Fantastic price. Really lovely watch, very bold and eye catching. Bought this as a gift and was very pleased with it. Great quality, size and the leather strap was exactly what I was looking for. The black and grey colouring looks good and is easy to read. I would definitely recommend this. I purchased this watch as a 18th birthday present for my grandson, his choice not mine. He thinks it is wonderful, I think it looks like my kitchen clock, thats because I am his grandmother.!!!!! Very nice watch, excellent fit. Would defiantly recommend to anyone looking at this item. Great watch, looks really good. Wish the clock hands were glow in the dark though! I have bought this for my husband for his birthday. I am pleased with the product. Looks so smart and stylish. The strap seems a bit stiff but thats what you would expect with a leather strap. Not sure of the fit yet as it isnt his birthday yet. I would recommend this product as it is very different and stands out looks a lot expensive than what it is. Excellent! I bought this as a gift for my boyfriend he chose it and it came exactly as described. Also comes with a nice little tin, I also had this item gift wrapped and it came in the classic, white wrapping with a green ribbon, very nice and classic which reflects the product well. I also like that the watch itself has a big face, easy to read and a lovely leather strap. Would definitely recommend this product to others. The all out black styling of the watch, gives it a striking and clean look. The leather strap provides a comfortable feel, making it easy to wear all day. Bar telling time, the watches features are pretty limited but its clealry not a tech laden watch......more style then substance! Bought the brown version of this watch also and both have lasted and lasted well, standing up to everyday and night life well. Definitely recommend! Great product at a great pice, excellent delivery and customer service.very impressed. 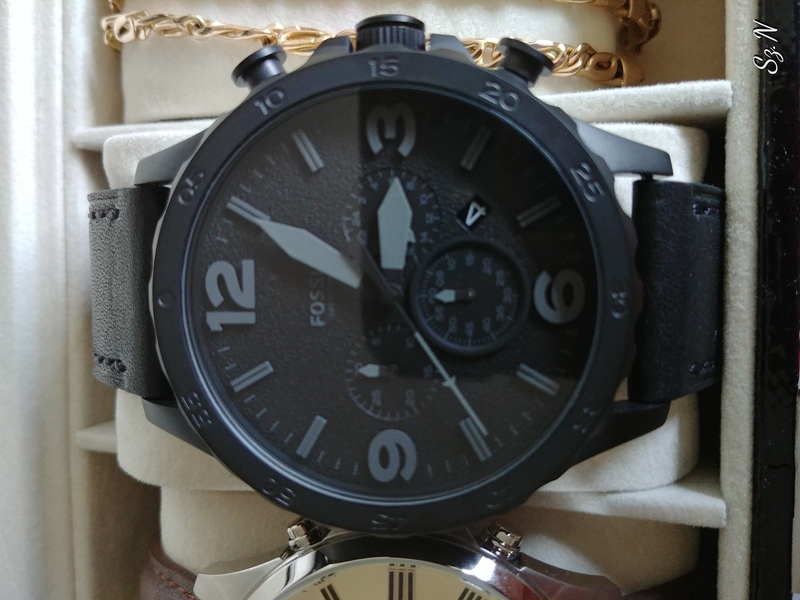 The watch was as described and pictured, the delivery was prompt and would recommend, it was a birthday present for my son so I had it gift wrapped and was also very please with the overall look and quality. Thank you. I loved this watch and thankfully my boyfriend loved it too! Lovely watch. As good a quality as it looks in the picture. Great service and speedy delivery from Watch Shop. I bought this as a gift for my boyfriend, it was a challenge to choose the right watch as he is quite fussy but I am happy to say he was very pleased with this excellent watch. Firstly he was slightly concerned the watch was too big but the colour, design and quality is so good that he could look pass this and get use to it. The watches has a sophisticated style perfect for special or professional occasions, whist the stop watch feature leads itself to sporting activities. The strap is stiff at first being real leather but soften quickly and its quality is second to none. The textures and materials on the watches face come together to form the elegant, subtle, classic design, while the all black colour and size offer a contemporary touch. Fantastic service, quick delivery and the watch looked exactly as described. I have already recommended you web site to friends. It has an excellent look, its really a magnet for catching glances. Quite large and heavy quartz compartment, displaying masculinity. 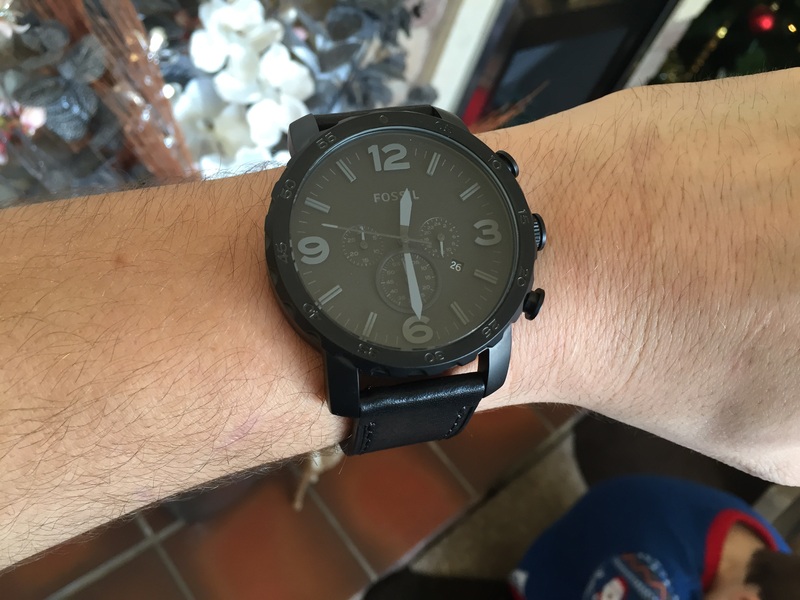 Great watch very pleased, cheaper than through Fossil shop plus got 6% off with a code! Very happy! Fast delivery although would like a box to state leave with neighbour as was out so had to collect from main post office 5 miles away in the middle of a v busy major town. Because of double Bank hol we had to wait till the tues! This was my sons 16th pressi & he had to wait as was delivered on a thurs & u have to wait 48hrs till u can collect! Otherwise all good! The item was bought as a gift for my fiancé and he loves the watch it is very well built and good quality . 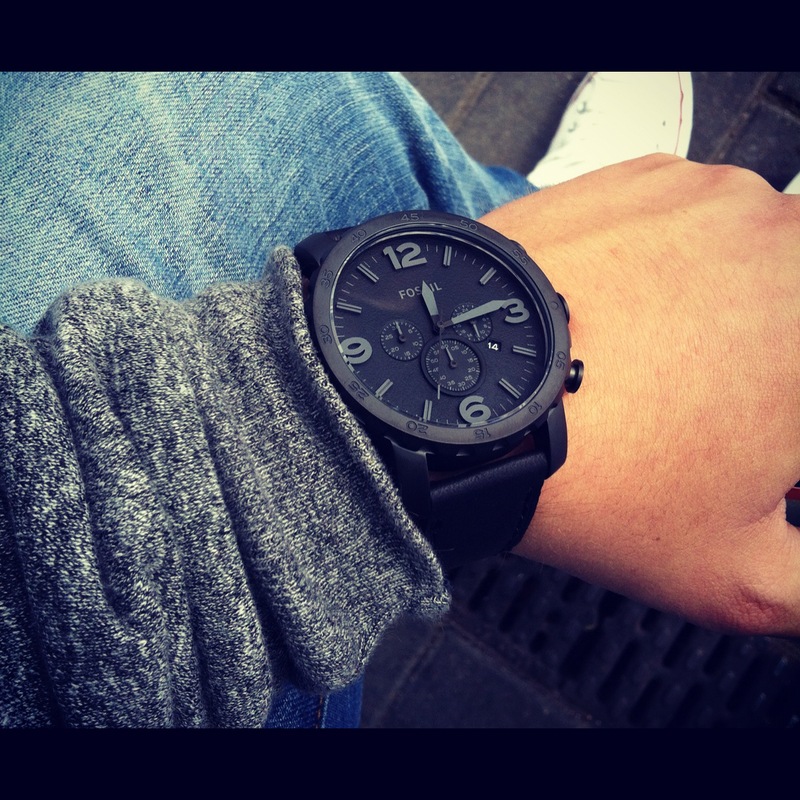 As the watch is all black it looks really smart!! 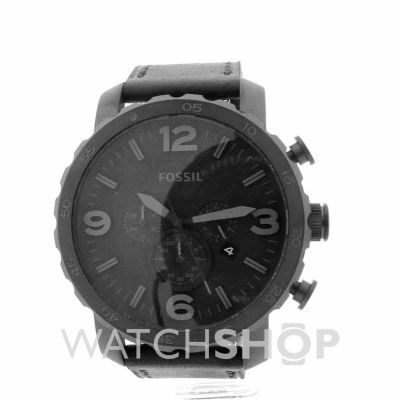 Would definatly order fossil again and would recommend this watch. This is my first watch Ive owned Present for my 25th Birthday today! and Im so pleased with it. it is rather large but that is why I wanted it! but It looks amazing, even with my smallish hands. The watch itself is very masculine with it being all black and grey. The strap feels very strong and sturdy and has a luxury feel to it. Im not the best at writing reviews, but Im in love with this watch and I may be back for more Fossil watches in the future. I can see myself buying more in different colors / styles. Service was brilliant would definitely use this site agai. And recommend it to all my friends!! Great looking LARGE face watch. Strap is a bit stiff but hopefully that will loosen with wear. Near silent operation and great sturdy build quality. Compact packaging and all round excellent value for money. Nice looking watch, very comfortable. Brilliant watch for the price! Suitable for younger people, big face watch not great for small wrists. I just receives it, and it looks much cooler then in the picture. What I love the most is its size and the matt tone. The watch looks very high-quality and worth of every penny. Its a gift for my boyfriend and I think it will make him look very masculine and he will love it! I bought this watch for my boyfriend as a surprise and was a bit anxious about the size and how it would look. It came beautifully wrapped and was exactly how it looked on the website. He was a bit unsure at first because he isnt used to such a big watch but he absolutely loves it and although the watch is big it doesnt look it. He gets complimented on it everywhere he goes and the all black design makes it a really unique watch. Very happy with my purchase ! Love my new watch! Love my new watch! Love my new watch! Love my new watch! Love my new watch! Item was exactly what I hoped. Love the watch face and the whole watch looks and feels top quality. Bought it for my boyfriend for his birthday and he was very happy indeed. 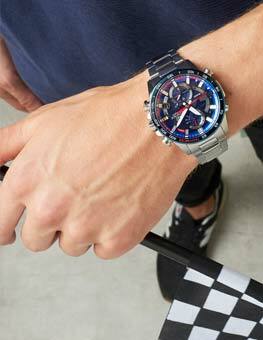 Bought this watch for my twin grandson, the watch is big and bold and makes quite a statement when worn he loves the watch. The watch is a real style gem. I got this for my boyfriend and he is very happy about the bold, masculine, but very sleek style of this watch. Even though the colour is all black, the numbers are grey so there is no problem in reading the time when dark. I am happy with the purchase. The delivery was quick and reliable. Its not a timepiece, but a personal statement and a serious attention getter. The big, all-black dial, and sturdy leather strap gives it i mean you a very tough look. The protruding knobs add even more to it. Looks great with a suit or a dress shirt, if you dont have any pink shirt in your closet. But looks even better on the wrist of a beer-stained-band-shirt wearing metalhead. Dont bother about your physique, Im 510 but very skinny, and this beefy watch still looks perfect,.. It has to do with the color, i guess. The functionality is pretty much as expected. The three main hands tell the time. One of the three sub-dial tells the 24-hour time. Helps you easily judge how much of the day you have already wasted in the bed. The other two sub-dials are for the chrono, and tell the seconds and minutes. You can start-pause-resume the stopwatch, of course. However, I find it a bit funny that on pressing the reset, the chrono hands dont directly go to 12-0-clock position, they unwind all the way back. Like, if you have recorded 15 mins, the seconds hand will go anticlockwise 15 times to bring the mins hand to 0. The only down side is the comfort and that the leather strap is way too tough. I mean, it wont bend easily when you are trying to tie it. Nevertheless, its just a small glitch, and mine is already getting softer by use. The holes on the strap are however plenty, letting you wear it on your finger or on the neck if you like. I ordered it on a Sunday, the order dispatched Monday, and I got it here in a remote town of Finland on Thursday, without any expedited shipping. Ive also uploaded an unboxing video on youtube. Jr1354 unboxing. Delivery was very quick.  I bought my boyfriend this watch for valentines day. I am very happy this product, it looks just like it does in the picture if not even better. My boyfriends definitely happy with so this was s very good buy. Lovely watch, all black and matted so had a smooth chic look to the watch. My boyfriend loved the watch down to this and the lovely genuine leather watch strap- a must buy! A great watch which is rather large so not great for those with a smaller wrist as it will look slightly too large! Perfect otherwise though! 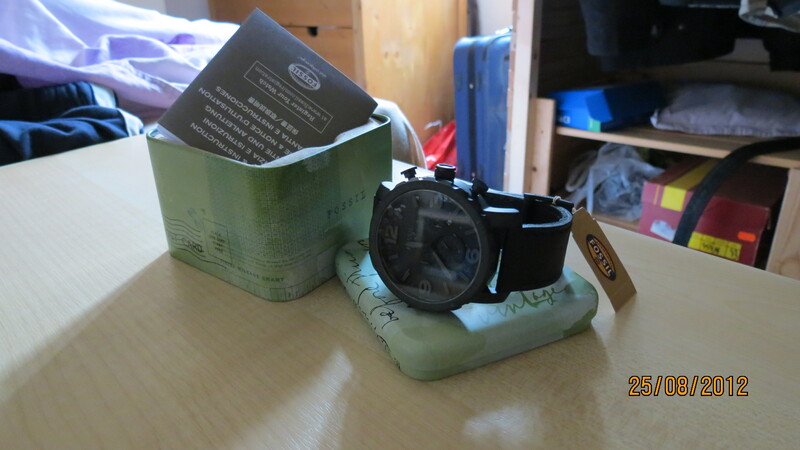 I was extremely happy with the purchase of, the mens fossil nate chronograph watch JR1354. When it first arrived I could not have been any more satisfied with the product. 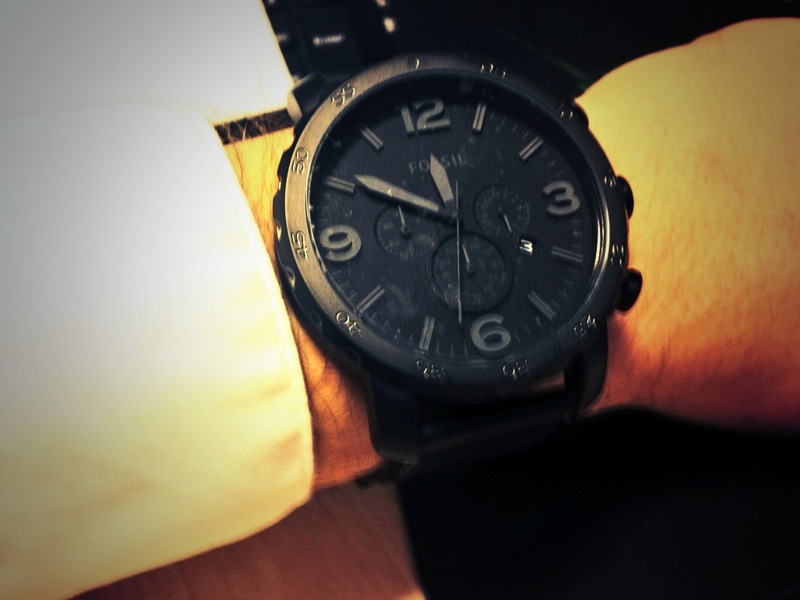 The black on black look is elegant and smart, and bodes well with the casual overall look of the watch. There are plenty of wrist holes to ensure it will fit all sizes which is good as it means there is no further need to add any more. 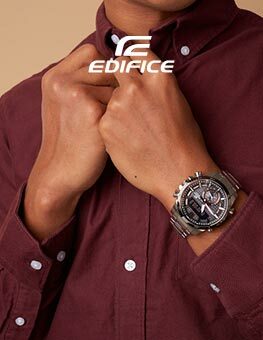 The large face of the watch adds a modern feature which is good as it perfectly suits the person who I purchased it for. The 3 dials within the face individually showing the seconds, minute and 24 hour hand alongside the main clock time is another great feature of the watch as it is many different services within the one watch. The watch is nice and bold and not too heavy, as I expected it to be a lot heavier due to the size of its face. I am delighted with the overall performance of the watch and would definitely recommend it to others as a girl or self purchase. 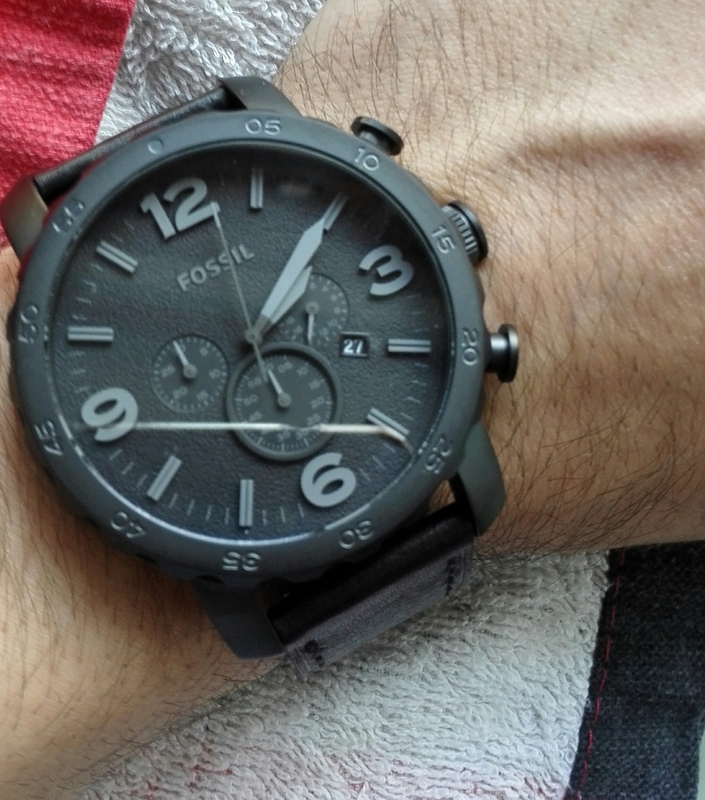 This fossil sleek black design watch is perhaps more beautiful than I had thought when purchasing it online. The shinny leather makes it a perfect blend for any kind of skin that would wear it. It can also match any kind of wears, casual or formal. My major attraction is the high visibility hour markers and the big, attractive round face of the black iron-plated steel. 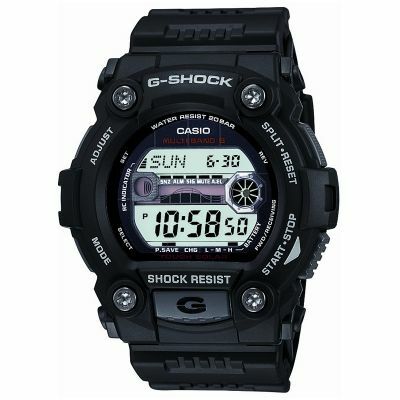 Its very noticeable on the wrist but not too flashy which makes it a good choice for men of class. The leather strap is made of a very strong material, able to withstand wriggling and folding. The leather strap hook could be redesigned to give it an invincible look. Overall, I am very satisfied because it gives me pleasure wearing it on my wrist anytime and I would gladly recommend it to anyone for its affordability. I bought this watch for my boyfriends birthday. He really wanted an all black watch which I thought would look too dark but this watch has converted me. It looks great both dressed up and dressed down and is a very masculine watch that makes him feel like he is James Bond!! As a product I think it looks great, although it is all black the screen is still clear and its easy to read the time something I was worried about. The watch is pretty chunky, something that didnt bother my tall boyfriend at all but I guess on a short man might look a little odd but thats just personal preference. All in all a very stylish watch that I would certainly recommend to someone. This Fossil is a good watch. I like the black color of the outer watch and the grey color of the numbers. Its grips your wrist and fits comfortably. The three knobs at the side are big enough for adjusting any timer settings. 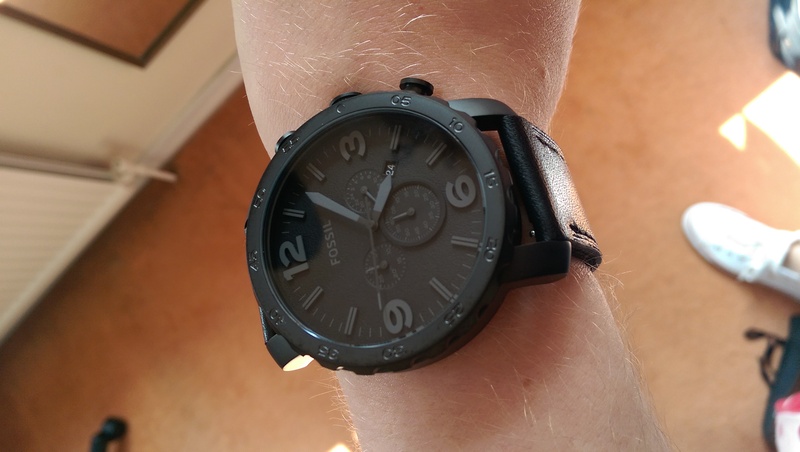 My first watch and first Fossil, im very pleased of it , the quality is really good from my point of view , the two tone colour black and grey gives it an aggressive manly look , its perfect for someone who wants to stand up from the crowd with a nice big dial watch. For a general view of the watch is a great deal for its price, for someone that is looking for something unique and manly. 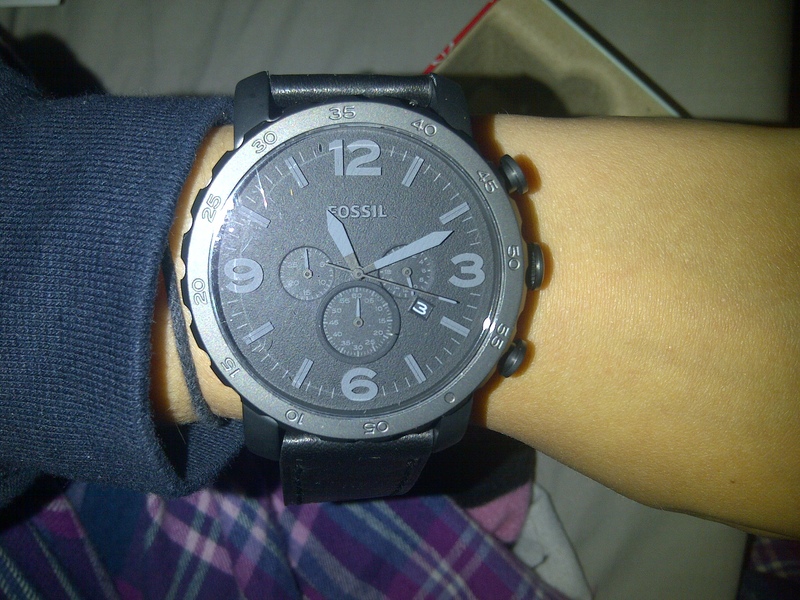 The watch is perfect, my 1st fossil but im sure that not last.. everybody love it and me to. For that price and desing is the best choice. They looks expensive and luxury. Leather is pfine but it could be betterr with the clip on strap or i dont know how to name that thing on strap. The watch is perfect. A bit on the big side though 50mm. 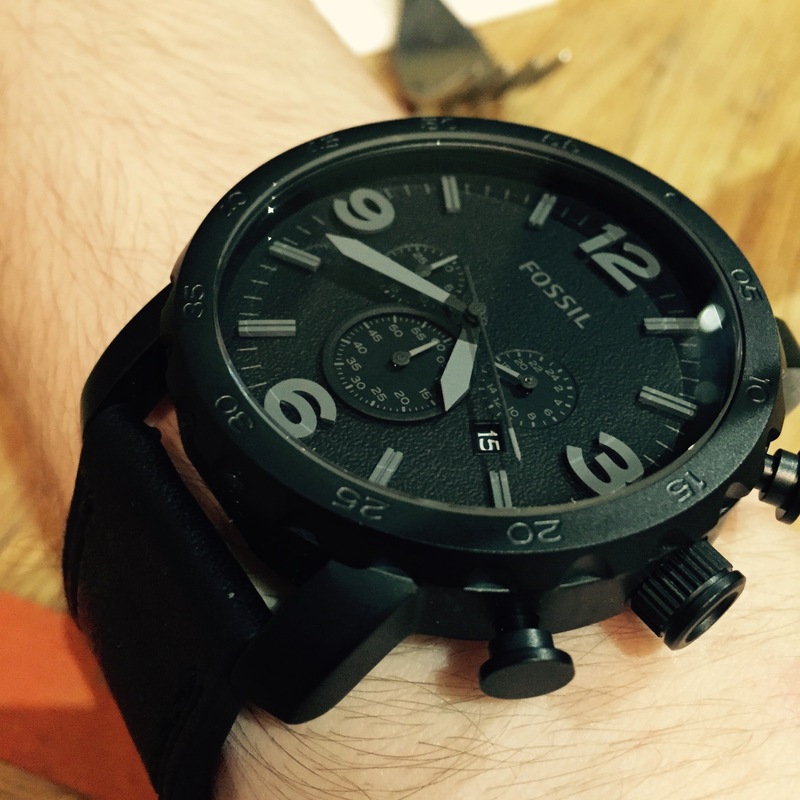 Fossil really are exceptional watch makers. The leather strap is also really thick. Really happy with my purchase.